A huge, foul-smelling creature that washed up on a beach has left locals terrified that it could spell impending doom. 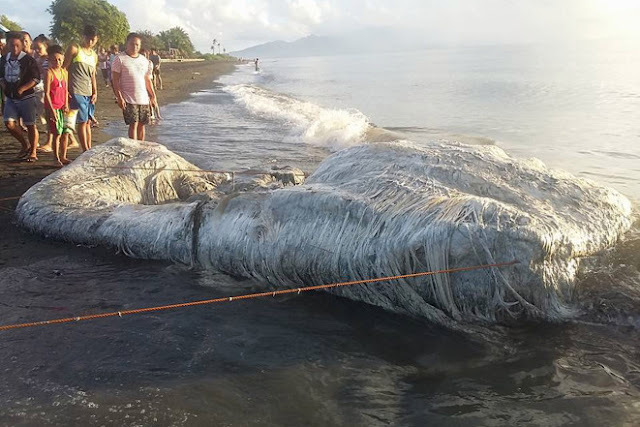 The beast was found at about 7 p.m. on May 11, with villages in the Philippines fearing the so-called “globster” could be a semi-mythological sea creature that washes up on beaches shortly before natural disasters. Villagers flocked to see the 20-foot-long carcass, posing for selfies in Oriental Mindoro province. Marine workers later arrived to take samples of the unidentified creature, which officials believe is some sort of whale. But some locals are convinced the beast is an ominous sign of an impending disaster. Neighboring residents gathered around the creepy corpse lying in shallow water on the beach in the town of San Antonio for a closer look. It is about 4 feet wide at one end and about 2 feet wide at the other with a grayish-white color. A similar “globster” appeared in Dinagat Islands, the Philippines, in February 2017, baffling officials. Government workers from the Bureau of Fisheries and Aquatic Resources in the Mimapora region were to dispose of the creature Tuesday. Fishery Law Enforcement Officer Vox Krusada said: “Today we just gathered samples of it for further analysis. “For now we can say it’s a whale, but the exact species is still unknown. The tissue samples are now sent to our lab for DNA analysis. The local government of Gloria will bury the carcass. And damn it smells awful, it smells like something from another planet. 0 Response to "Villagers believe this mystery sea creature is a very bad sign"